Colourful and cosmopolitan, with a cheeky edge and a hint of seediness, Brighton is a haven of indulgence for all the senses. From the crunch of pebbles underfoot to the thump of dubstep from nightclubs, the sting of salty wind on your face, to the sweet stickiness of neon pink rock, it's a city that wants to share all its delights with you. So fabulous local caterer Jessica Haggerty needed to look no further than her home town to find the inspiration for this luscious collection of delicious bakes. Evocative photographs by Stuart Ovenden, Deputy Art Editor of Good Food magazine, reflect the quirky spirit of the town and highlight the sensational food. Jessica takes you through the seasons with contemporary recipes for cakes, muffins, pies and tarts, all using fresh local produce and showcasing a unique blend of urban chic and old-fashioned flavours. Bake a batch of fragrant lemon geranium muffins for a summer picnic, or warm up a winter's evening with dark chocolate chilli gingerbread. Capture Brighton's vibrant, seductive spirit with Margarita cupcakes (why drink when you can have a cocktail in a cake? ), sumptuous garlicky pots with rosemary olive crackers, and the ethereal White Night Cake. 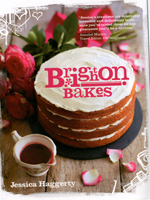 Irresistible and individual treats for every occasion from a passionate baker, beautifully photographed throughout.